I was amazed by the Hasselback potatoes every since I first saw it. Initially I though it would take some fancy knifework or some exotic equipment to get a potato to look this pretty. After a little reading up, I realized how wrong I was. Once, I figured out how easy it was, I decided to try it out. 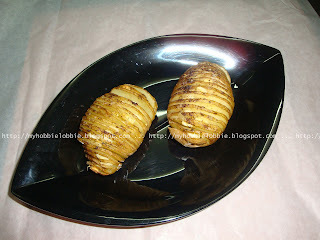 I think I can eat potatoes in almost any form - baked, roasted, boiled or fried. I have yet to meet a potato I didn't love. What made this different was the slices of garlic between the slices of potato. Everything about this was just right. I am quite eager to make these for the next dinner party I throw. I know it will look stunning on the table. Wash the potatoes well and scrub them. With the skin on, place the potato on a cutting board, with the flat side down and cut into slices almost all the way, but not seperating the slices from the base of the potato. You are basically making slits without cutting the slices through. Place a slice of garlic in each gap between the slits of the potato. Arrange the potatoes in a baking dish. Place a small knob of butter on each potato and drizzle with a little olive oil and sprinkle with salt and pepper to taste. Bake for about 40 minutes or until the potatoes are crisp on the outside and the flesh is soft and fluffy on the inside. If you want, you can place a small knob of butter when you get it out of the oven. Serve immediately. The next time, I'm going to sprinkle some chives over the potatoes midway through baking. These look so delicious. I can't wait to try these for when I have company over. Yummy! Potatoes look simply delicious and wonderful. Thank you Alpana, Rochelle and Deepa! I just love these potatoes, they are just delicious and a great side. Thank you so much for sharing with Full Plate Thursday and hope you are having a great week! Slices of garlic inbetween? Heavenly! This is a must-try for sure! Thank you for being a part of "A Little Birdie Told Me..." Trisha! I'm spotlighting your post on my Facebook page today. Jenn, thank u! U've made my day, yet again!